Are you feeling completely overwhelmed by the amount of work that needs to get done…like, yesterday? We live in a culture of ‘busy.’ Everyone always has more to-do’s than time in the day and competing priorities can make us feel like we never get anything done. But trust us, developing the reputation of someone who is always ‘SO BUSY’ does not impress anyone and can leave colleagues wondering if you know how to manage your time. These four ideas will help you focus on fewer priorities to take charge of your day and move the needle on your business. OKR’s, KPI’s, or SMART goals. Whatever method you prefer, your business needs a goal setting process. Set 3-5 measurable goals each quarter. If the vast majority of the work you are doing doesn’t directly support hitting these goals, it’s time to shuffle your priorities or remove non-essential tasks. One of my favorite exercises is to arrange your tasks on the below matrix. For each “item” on your to-do list, ask yourself: What is the level of effort needed to complete this task? What is the anticipated impact to the business if we complete this task? 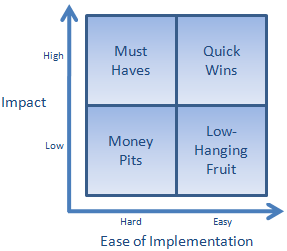 You should be spending most of your time in the Must Haves and Quick Wins quadrants. Do a lot of tasks fall into Money Pits? (Yes, I know it’s a harsh name). If so, take a step back and evaluate if you can eliminate these low impact tasks. If they really must be done, you better start looking for a way to reduce the difficulty. We don’t work in a vacuum. Often our priorities require a colleague’s input, approval or pre-work. Before starting a project, do your best to anticipate roadblocks and develop a clear path to completion. Once a project is ready for your attention, schedule an uninterrupted block of time to make progress. Frequently switching tasks lowers productivity, results in poorer work quality and gives you that dreaded frantic feeling. By now you may be making excuses. “I have multiple teams that need my attention!” “I can’t just quit doing the things I’ve always done.” Outline your priorities and timelines using the above tips and communicate with relevant stakeholders. Yes, it may take you a little longer to get to a given project, but you can reassure the effected team members that once you start, the project will have a bigger chunk of your attention and will be completed more quickly from start to finish. It’s easy to be overwhelmed by competing priorities and endless opportunities in business and in our personal lives. By outlining the desired end result, you can define a clear path to greater impact. Have you used any of the above methods? Are there other productivity tips you use to manage your day? Let us know what you think in the comment section.